The Kia Stonic arrives in Irish showrooms this week. The SUV inspired Stonic is an important conquest model for Kia in a fast growing B-SUV segment. There will be four trim levels with a choice of three petrol engines and one diesel engine in Irish showrooms. Prices will range from €18,599 for Stonic K1 l 1.2 petrol model to the top of the range Stonic K4 model powered by the 1.0TDGi (petrol) at €24,599. The K1 entry level spec includes the following equipment as standard: ISG, skid plate (front and rear), audio remote, Bluetooth, 3.5 cluster, 7 inch screen, 15 inch alloy, leather gear knob and handle, front armrest, spare wheel, privacy glass, rear USB, speed limiter, cruise control, centre console and rear USB and charger. The Stonic K2 trim with a choice of 1.4 petrol or 1.6 diesel engines adds the following spec enhancements; 17 inch alloys ,roof rails ,auto light control, DRL LEDs, bi function protection lamps, electrically heated and folding wing mirrors, 3.5 super vision cluster, RPAS, manual ,A/C on top of the standard equipment. The Stonic K3 model with the same engine choice also includes ADAS, LED rear lights , chrome belt line, two tone leather, heated front seats, 7 inch SAT NAV, DAB radio ,rear view camera and ECM interior mirror. The top of the range K4 model with its 120 PS turbo petrol engine comes fitted with Smart Key, metal pedals, blind spot detector, dual auto air con with rain sensor. All K3 and K4 models come with the option of two tone roof and interior trim personalisation. “The Stonic will be an important conquest model for Kia in one of the newest and fastest-growing vehicle segments. In Ireland, the B-SUV segment is expected to grow by 100% in the next two years as demand for traditional B and C segment cars declines. 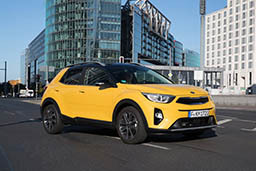 We expect Stonic to become an extremely important part of our product mix here in Ireland and become as just as successful as our flagship Sportage and cee’d models.,” commented James Brooks, Managing Director of Kia Motors Ireland. “Kia has listened to customers all over Europe and our engineering and design teams have responded in creating the Kia Stonic, we believe the Stonic will be a stand out rival to other competitor models in the B-SUV segment.” added Mr. Brooks. The design is greatly influenced by a philosophy championed by Chief Design Officer Peter Schreyer – “the simplicity of the straight line”. The result is one of the brand’s most striking cars to date, and it remains immediately recognisable as a Kia thanks to a series of signature design elements. Kia’s hallmark ‘tiger-nose’ grille has been modernised with a new three-dimensional chrome surround, while wide C-pillars echo existing Kia designs, from the brand’s city cars up to its full-sized SUVs. Like all Kia models, the Stonic’s body blends sharp horizontal feature lines with softer sculpted surfaces. The Stonic brings an exciting and confident dynamic character to the B-SUV segment, with ride and handling characteristics honed on a variety of European roads to match local preferences. The aim of the development team was to combine sporty and precise handling with straight-line stability and a smooth ride at higher speeds. More than any other production Kia model to date, the company’s engineers have given greater priority to sporty, confidence-inspiring dynamics, with direct and immediate responses. The Stonic features new front and rear suspension setups which are unique to the car, resulting in a fun-to-drive character. Hydraulic rebound stoppers on the front axle absorb impacts more smoothly when driving over broken road surfaces, while also limiting ‘float’ over undulations at higher speeds. The Stonic’s cabin echoes the appearance of the exterior, combining straight lines and smooth surfaces. The interior brings together sculpted shapes with geometric forms, and the surface of the dashboard itself is inspired by the clearly-defined lines of the Stonic’s exterior. The painted dashboard panel in front of the passenger seat bears the same ‘tiger-nose’ detail as the grille, while vents at the outer edges of the dashboard even echo the shape of the headlamps. Within its compact exterior dimensions, the Stonic’s smart packaging maximises interior space for all occupants. The cabin offers plenty of space for driver and passengers, with 1,070mm and 850mm legroom for front and rear passengers, 996mm and 975mm headroom, and generous shoulder room of 1,375mm and 1,355mm, respectively. In addition, the D-cut steering wheel and raised, flat base of the dashboard creates generous knee room for front passengers. The 45-litre fuel tank is located beneath the rear bench to provide rear passengers with ample legroom and a low seating position. The Stonic incorporates a range of intuitive technologies to enhance comfort and convenience for all occupants. One of the most modern, high-tech cars in its class, Kia’s new B-SUV has an infotainment system that seamlessly blends smartphone functionality with the control of key vehicle functions. The large 7.0-inch touchscreen at the centre of dashboard provides the control panel for the Stonic. The system is sold as standard with Apple CarPlay™ (for iPhone 5 or newer) and Android Auto™ (for Android 5.0 Lollipop or newer), offering full access to smartphone functionality. The systems allow users to access navigation via Apple Maps or Google Maps, use apps on-the-go, and stream music. Drivers can control the systems with Siri voice control or with ‘OK Google’ voice commands. There are pinch-and-swipe and voice controls, and optional navigation and DAB digital radio. A USB port in the front of the cabin enables users to physically connect and charge a mobile device. A USB port is also fitted in the rear when buyers specify the optional console armrest. The Stonic is built on a strong, lightweight platform and bodyshell for maximum passive safety. A high proportion of the new B-SUV’s bodyshell is made up of Advanced High Strength Steel, and features 98 metres of structural adhesive welding to further enhance stiffness and safety. The body’s energy flow paths are designed to effectively dissipate energy during a collision, around, above and under the passenger compartment. The Stonic is also fitted with six airbags as standard (driver, passenger, side and curtain), as well as ISOFIX child-seat anchor points in the rear cabin.